Among the multi-bid leagues, here is how each has fared after Friday, Saturday and Sunday games. Cal State Fullerton took the Stanford Regional with a 5-2 victory over #2 National seed and host Stanford. Ruben Cardenas hit a three run home run as the Titans got five runs on four hits. Tanner Bibee started for Fullerton and had 11 strikeouts. He worked 6.2 innings and allowed five hits and two runs. Blake Workman worked the final 2.1 scoreless and struck out four. Brandon Wulff went 3-4 to lead Stanford’s offense. Fullerton will face Washington in the Supers. Both teams are #3 seeds so there is some mystery in the location for the matchup. Texas heads to the Super Regionals after taking the regional title with a 3-2 victory over Indiana. Zach Zubia homered and Kody Clemens had a pair of hits in the victory. Blair Henley started and gave the Horns 7.1 innings. He allowed six hits and two unearned runs. He fanned eight and did not walk a batter. Luke Miller led Indiana with three hits. Texas faces the winner of the Oxford Regional. Oregon State is headed to the Supers after dispatching LSU 12-0 in the Corvallis Regional final. Kevin Abel went eight innings and allowed only three hits and no runs. He struck out eight and walked one. Steven Kwan and Cadyn Grenier each homered. Kwan and Kyle Nobach had three hits each. In the Oxford Regional, #1 Ole Miss won a wild one over #2 Tennessee Tech 9-8. Will Golsan had three hits and three RBI’s to lead the Rebels’ lineup. Tennessee Tech slugged three home runs with Nick Osborne hitting two of them and Brennon Kaleiwahea hitting the other. Tech outhit Ole Miss 12-9 but came up short on the scoreboard. Tennessee Tech is playing Missouri State currently. The winner faces Ole Miss Monday. In the Gainesville Regional, #3 FAU 12, #2 Jacksonville 7 – FAU had 17 hits with three home runs to push them into the regional final against Florida. Cody Wilson had three hits and a home run. Eric Rivera and Gunnar Lambert also homered. Angel Camacho led JU with three hits. In the Greenville Regional, #4 UNC Wilmington 9, #1 East Carolina 7 – The Seahwaks scored all nine of their runs in the fifth inning and held on for two run win. Noah Bridges went 3-4 for the Seahawks who will face South Carolina Monday. In the Tallahassee Regional, #2 Mississippi State 13, #3 Oklahoma 5 – The Bulldogs forced a game seven title game with Oklahoma with a decisive victory Sunday. Rowdey Jordan had three hits including a home run while Jake Mangum added three hits in the win. Cole Gordon entered in relief and logged the final six innings saving the bullpen for the final game. Vanderbilt tied an NCAA record with nine home runs in a 19-6 bludgeoning of Clemson to win their second consecutive Clemson Regional title. Connor Kaiser went 5-7 with three home runs and 10 RBI’s. Stephen Scott and Philip Clarke each had a pair of homers while Julian Infante and Harrison Ray also went deep. Clemson got homers from Chris Williams and Kyle Wilkie as part of their eight hit effort. Vanderbilt will face the winner of the Tallahassee Regional where Mississippi State and Oklahoma are the final two teams alive. Since neither number one seed is alive, the NCAA would decide the host team for that Super Regional. Arkansas won the Fayetteville Regional thanks to a strong relief effort by Jake Reindl who logged seven innings in the 4-3 victory. He relieved Isaiah Campbell who did not retire a batter. Matt Cronin worked the final two innings for the save. DBU was led by Jimmy Glowenke who went 3-4. Arkansas will host the winner of the Greenville Regional where South Carolina and North Carolina Wilmington are the finalists. Texas Tech rolled through the Lubbock Regional in impressive fashion culminating with an 11-6 victory over Louisville. Zach Rheams went 4-4 with two homers and five RBI’s. Cody Fahat chipped in with two hits, a home run and three runs batted in. Davis Martin started and gave them five innings. Louisville got a 3-5 effort with a home run from Jake Snider. The Red Raiders will face the winner of the Athens Regional where Georgia and Duke are the finalists. Auburn captured the Raleigh Regional title with a 15-7 victory over NC State. Auburn had 16 hits with Josh Anthony getting four of them. Jay Estes and Steven Williams added three each. Edouard Julien hit his 17th home run of the season. NC State was led by Patrick Bailey’s three hits and a pinch hit homer from Shane Shepard. Auburn will face the winner of the Gainesville Regional. Minnesota won the Minneapolis Regional with a 13-8 victory over UCLA. Alex Boxwell and Toby Hanson homered for the Gophers. Boxwell had four RBI’s. Daniel Amaral went 3-3 for UCLA. Minnesota will face the winner of the Corvallis Regional. North Carolina won the Chapel Hill Regional beating Houston 19-11. The Tar Heels had 18 hits with Michael Busch, Ike Freeman and Zack Gahagan all collecting three hits. Houston hot three home runs among their 17 hits. Jared Triolo, Joe Davis and Drew Minter all homered for the Cougars. North Carolina faces Stetson next weekend in Chapel Hill. We have our first pair of clubs win regional titles as Washington won the Conway Regional while Stetson won the Deland Regional. 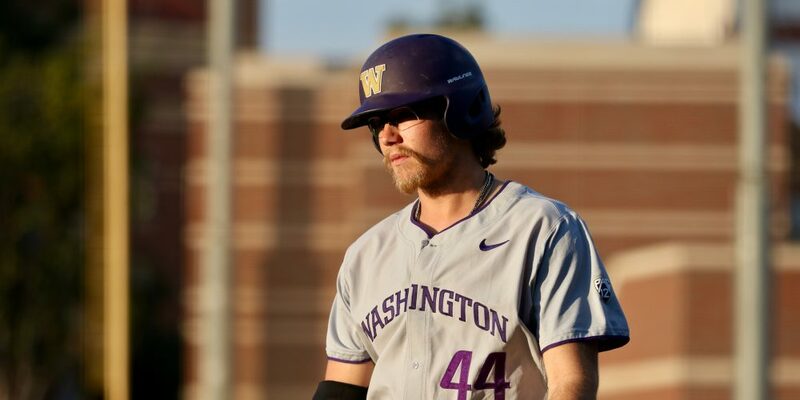 Washington was one of the teams that sat on the NCAA bubble because their RPI was in the 70s. They won a series over #2 National seed Stanford to boost their overall resume and earn an invitation to the field. The Huskies beat Connecticut Friday, Coastal Carolina Saturday and Connecticut again Sunday. They are paired with the Stanford Regional, where Stanford and Cal State Fullerton are the finalists. Joe Wainhouse continued his hot hitting with three hits and a homer in the 9-6 victory Sunday. AJ Graffinino also had three hits for UW attack that managed 16 hits. Troy Stafanski went 5-5 for UConn. In Deland, Stetson gave the fans present for their first ever hosting experience a great memory with an 11-1 regional final victory over Oklahoma State. Jack Perkins logged a complete game, three hitter for the Hatters. He allowed one unearned run, walked one and struck out an eye-popping 13. Jacob Koos went 3-5 with three RBI’s to lead the Stetson lineup. Jonathan Meola also had three hits. Stetson put the game away in the third inning with a ten-run outburst. Stetson will face the winner of the Chapel Hill Regional. In the Athens Regional, #2 Duke 15, #3 Troy 6 – Chris Crabtree went 4-5 with a pair of homers and five RBI’s as Duke advances to the regional final versus Georgia Monday. The Blue Devils had 22 hits as Chris Proctor, Griffin Conine and Max Miller all had three hits. Bryce Jarvis was the most effective hurler with four hitless innings. In the Stanford Regional, #1 Stanford 4, #2 Baylor 2 – The Cardinal got a good start from Brendan Beck to advance to the regional final against Cal State Fullerton. Beck went 6.2 innings and allowed four hits and two runs. Jacob Palisch and Jack Little finished the victory. Andrew Daschbach homered and Will Mattiessen had two hits including a triple to pace the Stanford offense. Baylor’s Alex Phillips was great in relief with 5.2 innings of two-hit shutout ball. Shea Langeliers and Davion Downey each homered for the Bears. In the Lubbock Regional, #2 Louisville 12, #3 Kent State 6 – Louisville pounded out 15 hits to advance to the final against Texas Tech. Devin Mann had three hits and homer while Jake Snider and Danny Oriente had three hits apiece. Bobby Miller started and gave them eight innings. Pete Schuler and Nick Kanavas hoemered for Kent State. In the Fayetteville Regional, #3 Dallas Baptist 9, #2 Southern Miss 4 – DBU’s power surge continued with five home runs as they advanced the regional final. Devlin Grandberg, Gerrett Wolforth, Tim Millard, Kody Funderburk and Matt Duce all homered. Starter Luke Eldred gave them eight innings to save the pen. Matthew Guidry and Hunter Slater both homered for the Golden Eagles, who were held to five hits. In the Deland Regional, #3 Oklahoma State 6, #2 USF 1 – Jonathan Heasley worked a complete game, seven hitter with seven strikeouts and two walks to push Oklahoma State into the regional final against Stetson. Trever Boone slammed a pair of home runs for the Cowboys. Kyle Phillips had two hits to lead the USF offense. LSU survived a valient upset bid by in-state foe #4 seed Northwestern State winning 9-5. The Tigers entered the ninth inning trailing 5-4 but exploded with consecutive clutch hits to extend their season. LSU is down to weekend starters, Ma’khail Hilliard and AJ Labas, and this is their first week without them. That leads to a transition to some new arms during the worst possible time. Cam Sanders started and logged five innings. He allowed five hits and three runs. Matthew Beck worked three innings to pick up the win. Todd Peterson got the final three outs. Zach Watson had a home run while Austin Bain had four hits. Lenni Kunert had three hits including one of the Demons’ three home runs. Peyton Davis and Sam Taylor also homered. Now LSU has to piece together innings against one of the best teams in college baseball in Oregon State. They play at 9 ET tonight. In the Chapel Hill Regional, #3 Houston 8, #2 Purdue 4 – Houston scored four runs in the eighth inning to break up a tie game and advance the regional final against North Carolina. Joe Davis homered and drove in two runs. Purdue had a three hit day from Skyler Hunter, and homers from Jacson McGowan and Ben Nisle. In the Minneapolis Regional, #2 UCLA 10, #3 Gonzaga 4 – UCLA got a strong start from Ryan Garcia as they advanced to the final against Minnesota. Garcia went 7.1 innings and allowed only three hits, three runs – one earned. He struck out nine and walked two. The Bruins had 13 hits in the win. Gonzaga had a home run from Gunnar Schubert among their seven hits. In the Raleigh Regional, #1 North Carolina State 11, #4 Army 1 – Evan Edwards had a pair of home runs and Will Wilson added another as the Wolfpack eliminated Army Sunday. Johnny Piedmonte did not allow a hit in his four inning (52 pitch) start. Kent Klyman and Nolan Clenney completed the three-hitter. NC State faces Auburn in the regional final at 7 ET tonight. In the Austin Regional, #2 Indiana 9, #3 Texas A&M 7 – Indiana scored nine runs in the first inning and held on for dear life as the Aggies stormed back. Matt Lloyd and Scotty Bradley each homered while Lloyd and Luke Miller each had three hits. A&M rallied to cut the deficit to two and had the winning run at the plate but IU cliser Tim Herrin coaxed a double play ball to end it. Indiana faces Texas tonight in the regional final. In the Oxford Regional, #3 Missouri State 9, #4 Saint Louis 8 – The Missouri Valley champs stayed alive in dramatic fashion as they walked off Saint Louis. Hunter Stienmetz had a home run, three hits and three RBI’s and Jack Duffy had a three run home run for the Bears. Cole Dubet had a homer and three RBI while Alex King also homered for the Billikans. Missouri State lives to play Monday against the loser of tonight’s Ole Miss versus Tennessee Tech winners’ bracket game. They appear to be holding their pitching staff together with duct tape and bailing wire but Mississippi State won another one-run game beating Samford 9-8. The Bulldogs now get a chance to face an Oklahoma team that beat them 20-10 Friday. MSU jumped out early with a three run first thanks to home runs by Jake Mangum and Elijah MacNamee. They added to the lead to make it 5-0 in the third before Samford rallied for a five spot in the third. The game was tied until the seventh when MSU struck for three more. Samford rallied and cut it to 9-8 but that was it. Samford had homers from Brooks Carlson and Anthony Mulrine. Tanner Allen and Dustin Skelton each had three hits for Mississippi State. Stater Jacob Billingsley gave MSU a much-needed seven innings. Denver McQuary got two outs and threw 16 pitches in the eighth. He will start the regional final game tonight versus the Sooners at 6 PM ET on ESPNU. In the Athens Regional, #1 Georgia 11, #3 Troy 7 – Georgia advances to the regional final with a wild offensive victory. Keegan McGovern and Michael Curry had two home runs and three hits each. LJ Talley also had three hits. Troy got a pair of home runs from Brandon Lockridge – doubling his season home run total. Lockridge also had three hits. Drew Frederic also homered. Troy now faces Duke in an elimination game. Georgia gets the winner. In the Conway Regional, #2 Connecticut 6, #1 Coastal Carolina 5 – Another top seed is done as Coastal Carolina dropped a tough one. Connecticut scored in the bottom of the eighth on a home run by Christian Fedko – his first of the season. Anthony Prato and Isaac Feldstein also homered for the Huskies. Zach Biermann went 3-4 with a home runs and four RBIs for Coastal. Connecticut advances to face Washington in the regional final. In the Clemson Regional, #1 Clemson 9, #3 St. John’s 8 – Clemson survived a four run Red Storm ninth to advance to the regional final against Vanderbilt. Seth Beer hit his 22nd home run of the season. The Tigers scored nine runs on just nine hits thanks to receiving eight walks. The Red Storm had four home runs in their 16 hit total. Josh Shaw and Like Stampfil both had three hits with a home run. Mike Antico and Anthony Brocato also homered. Red Storm starter Jeff Belge allowed just three hits in his 5.2 inning stint. He fanned nine.